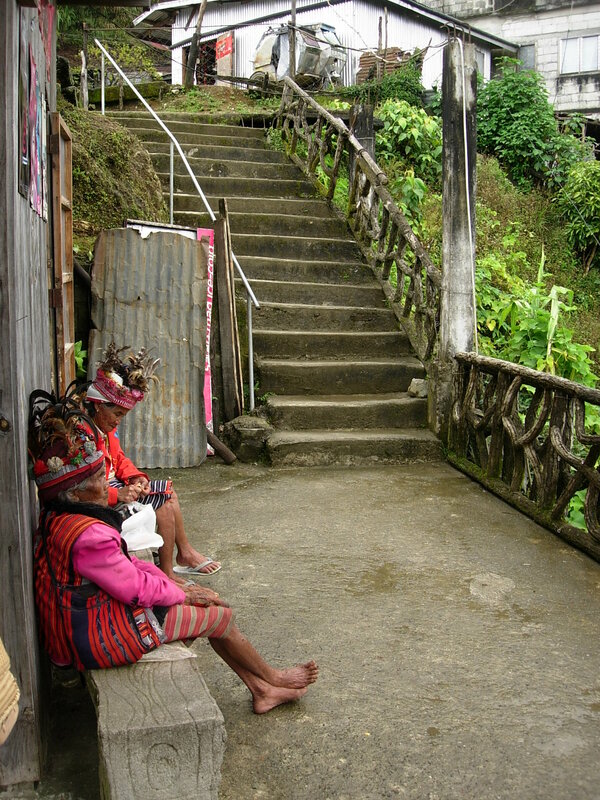 Touts swarmed around us and offered rides either to Banaue town or all the way to Sagada with a few stop-overs to take in the sights. We had yet to get our bearings, so we headed to Highland Valley along the road for some brunch. Everyone had the rice meals (Php 125) which came with a choice of either friend chicken or pork and a serving of vegetables. I had my oatmeal drink and ordered a tomate and onion omelet (Php 80). The food was reasonably good and the woman running it very cheerful. One of the drivers who approached us later came in and said he managed to round-up another group so it was all systems go for our trip to Sagada. That group (8 people) later came in so we waited for them to finish breakfast before we got started on our road trip. We each paid Php 300 for a ride on a large SUV. I snagged the front seat! We stopped at one of the view decks to see the famed rice terraces. It wasn’t as awesome as I expected maybe because it wasn’t planting season and the terraces were brown and it probably wasn’t one of the better vantage points. A large souvenir shop was renting-out head gear for Php 10.00. I did better, I bought one for Php 120.00 as a souvenir. I would have bought a spear and a shield too to complete the outfit if it weren’t going to be too bulky to bring along. The Ifugao are master carvers and the shop had a lot of carved figures on sale but what caught my eye was a small bulol carved from kamagong and costs Php 150, almost double the price of a larger one carved from ordinary wood and painted black. There were also drums decorated with relief carvings of lizards. “Tambor,” the proprietor answered when I asked what the drums were called. I didn’t buy one as I had one of those already. 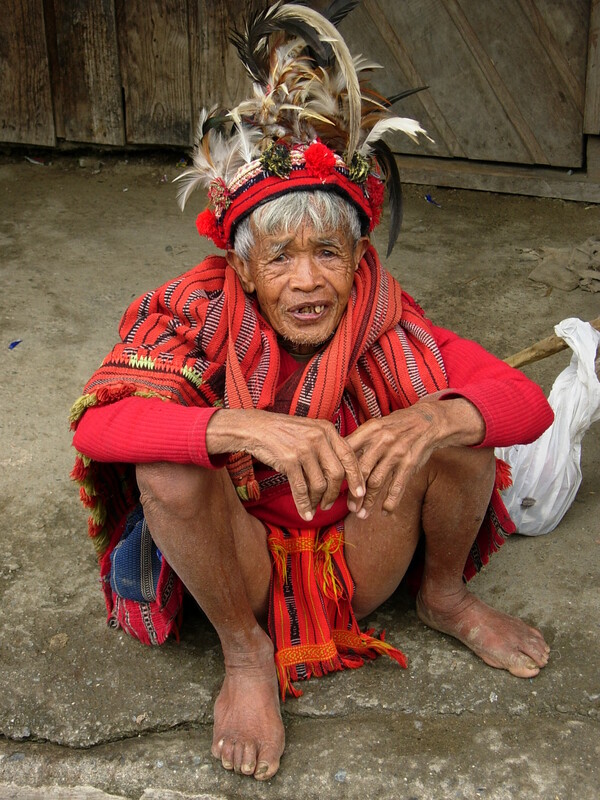 In search of a public restroom along the main road , I espied a very old man decked in his Ifugao finery. I asked permission to take his photo which he readily granted. “Donation?” he asked me. So I gave him Php 20.00. It’s sad that tradition exists only for the sake of tourist photographs rather than as part of a living breathing culture. It was an easy 2-hour ride to Bontoc town on the cemented highway. 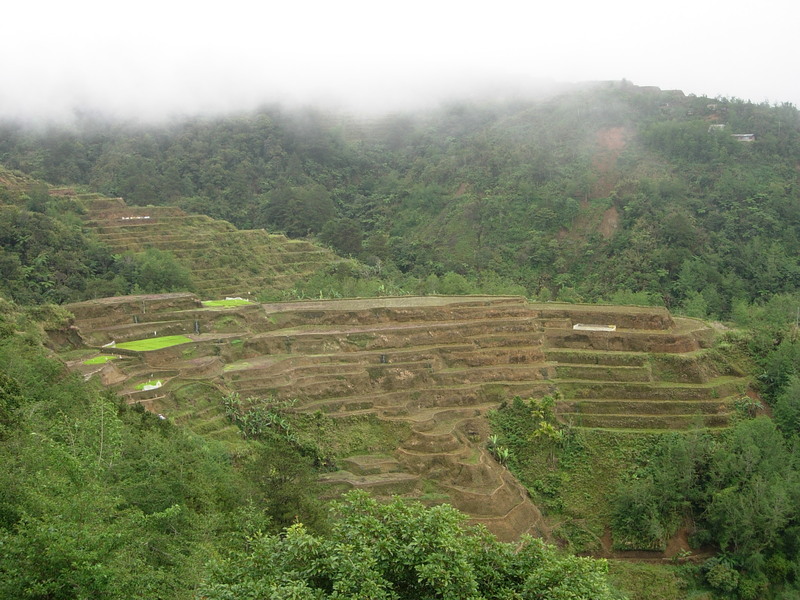 We passed through rice terraces and a few traditional Ifugao houses. We also passed by a guy in a traditional wooden scooter barreling down the road. About halfway to the town, we had a flat tire so we took pictures along the road while the driver changed the tire. Chatting with him, I told him I wanted to check out the Bontoc Museum as one of the Beyer great grandchildren was my classmate in Anthro school. The driver said I probably meant the Banaue Museum which was unfortunate as he would have taken us there if I had mentioned the Beyer museum. He was wondering why I wanted to go to the Bontoc Museum which had nothing more than photographs. Having realized that, we opted not to stop at Bontoc town and just proceed to the hour ride to Sagada town.It was early afternoon when we finally stepped out onto the central plaza of the town of Sagada. It was just as I remembered it from four years ago— a small town of ugly wood and tin roof structures and some low concrete ones. 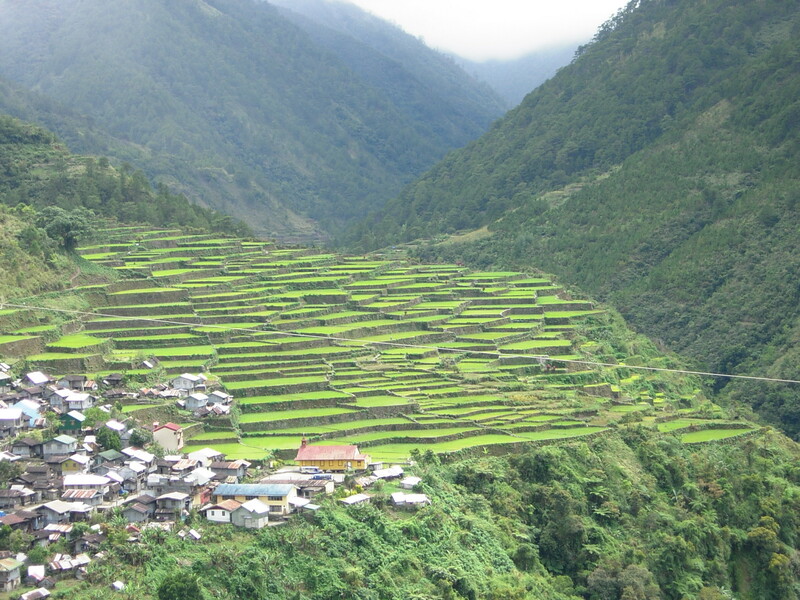 Just like the rest of the Cordilleras, traditional houses had been replaced by modern architectural elements. The town’s total lack of any charm or character belies the beauty of its surroundings. We got two rooms with two single beds and a double with ensuite bathroom at Sagada Guest House right at the town center for Php 400 per head which was a fairly good deal as the rooms were large and clean. The rooms with shared bathrooms were at Php 250 per head. On hindsight, we should have checked out the much cheaper places down the road. We registered (Php 20) at the Tourism office and checked-out the tours and guide fees which have all been standardized. 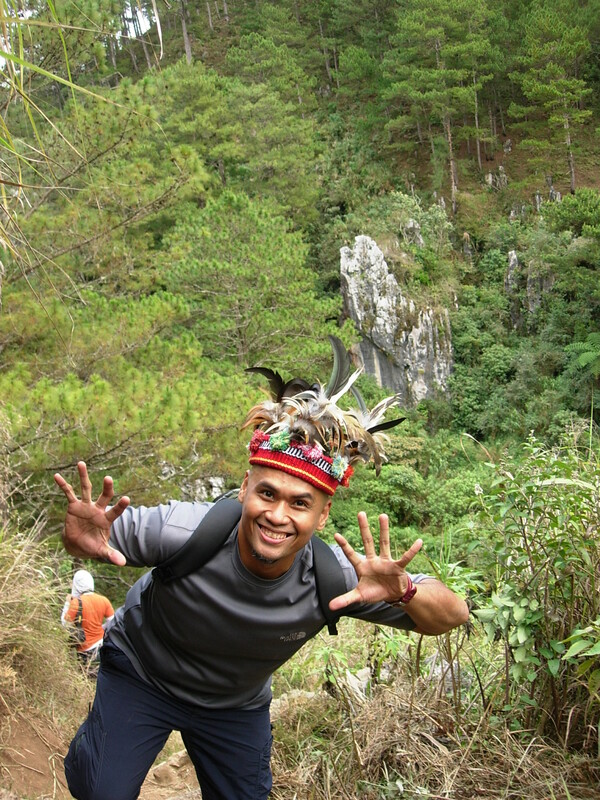 I noticed more tour packages such as ones that take in some peaks around Sagada and a couple of new places like Marlboro Country. Sagada’s tourism office is probably one of the most helpful and informative tourist offices. They have a list of all accommodations and the people there are really easy to deal with and make very helpful suggestions. We had late lunch at Yogurt House where I had yummy choco-chip oatmeal cookies (Php 100/pack) and a Triple Decker Tuna sandwich (Php 90) while the rest had rice meals and of course, yogurt. The food was still good, servings large (really good for two), and the prices reasonable. So named because of the echos that bounce-off the valley, Echo Valley is like a large green bowl of cliffs, small caves, and greenery. 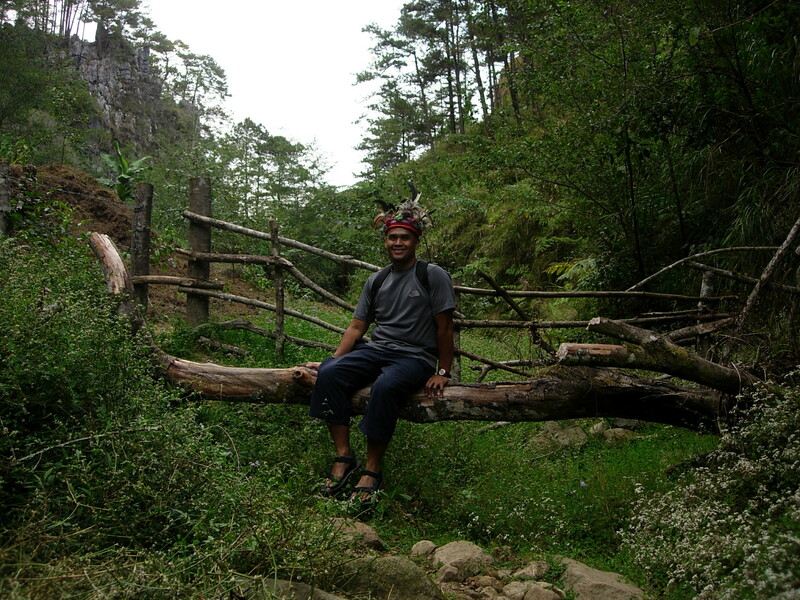 Perched on the rocky cliff faces are the traditional hanging coffins of the Aplai (the Sagada natives).We walked along a small trail as towering limestone cliffs with hanging coffins and lush greenery surrounded us. With no one else but us, it was all very peaceful. We hiked all the way down to the valley below and past the mouth of a large cave which cccording to Abril is not navigable. We scrambled up some large boulders to a flat valley until we came to a shallow river. We followed the stream of water into a cave semi-lit by a small opening on the roof. It was just a few meters deep but it was an experience nevertheless. 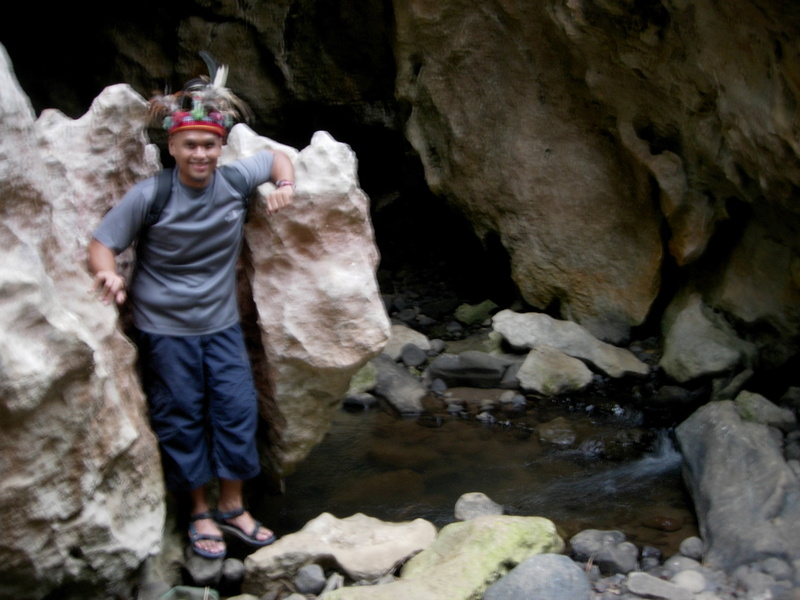 Emerging from the cave, it was an uphill climb passing by the overgrown entrance of another bigger cave that Abril said is no longer accessible due to incidences of people getting lost inside. Dusk had settled in by the time we made it back to the top on the main road near Sagada Weaving. We gave the two kids Php 70 each for their efforts. We rewarded our famished selves with a good dinner at Masferre Inn. Dedicated to the late Eduardo Masferre, the son of a Spanish soldier turned farmer who married a Kankana-ey, Masferre’s photographs of the Cordillera, its environs, culture, and its people, should be considered national treasures for capturing a long-gone era and heritage in the mountain area’s history. His photographs complete with short captions are displayed on the walls of the restaurant. Prices here are a little higher than Yoghurt’s but just as good though not as plentiful. Really yummy is the yogurt ice cream which sells for Php 10.00 a scoop at the small store attached to the restaurant which also has jams, cookies, mountain tea, and locally-grown coffee for sale. While waiting for my Masferre Club House sandwich, I dropped by the next door souvenir shop to check-out some stuff. As I came in, the shopkeeper was having a chit-chat with a college-looking girl and guy who I recognized as the young couple in costumes lunching at Yoghurt House earlier. They seemed concerned about someone they spoke with earlier that day . From what I overheard, they were doing a school project on drug use in Sagada and they interviewed a certain guy who seemed a bit threatening to them. The shopkeeper assured them that he was harmless and even more so his friends. The shop had some nice silver jewelry and a few crafts and the shopkeeper was very friendly and we chit-chatted about music. I bought a nose-flute which she says comes from Bontoc. Unfortunately, she can’t recall the name of the instrument. She advised me of a bugnas next week as it was postponed due to a death in one of the villages. She said it would be a good time to see some traditional activities. Back at the guesthouse, the guys wanted to go out and buy a bottle for socials but at the end, everyone just slept. Hi! do you have an Itinerary for this trip? kaya ba to ng weekend lang? hehe. btw. great post! this is very helpful! i like what you said about customs and traditions being alive only for the sake of tourism. but on the bright side, at least there’s that. otherwise, it will forever be gone. either way, it is a sad affair. 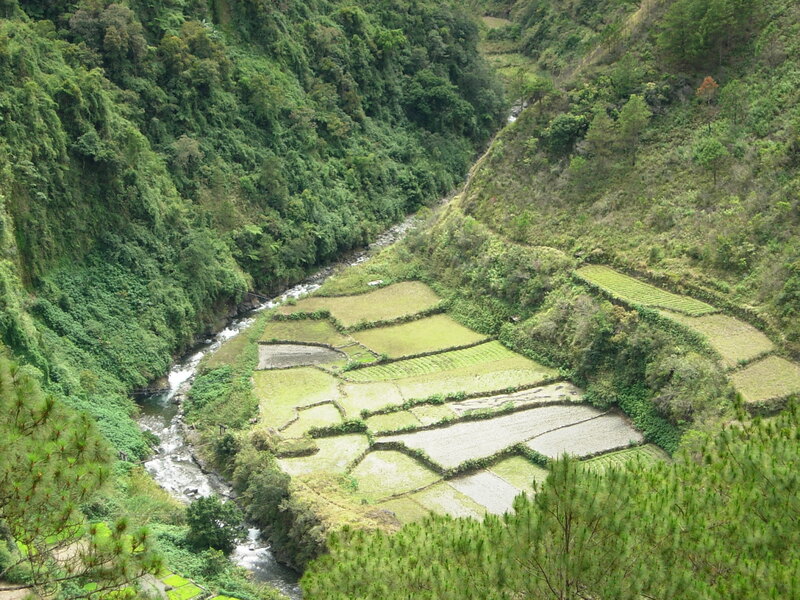 i’ve always wanted to go to banaue and sagada. your pictures reminded me again as to why. maybe when my kid’s a bit older. to be honest, with all the accidents i’ve seen on the news en route to banaue-sagada, it’s the travel to those places that’s making me nervous.